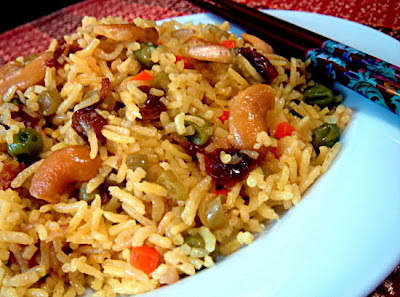 Discription:This is very tasty veg rice.Try it and Enjoy!!!!! Wash and drain rice on a kitchen towel. When it is slightly dry, heat 2 tbsp oils in a large pan and splutter cardamon, cinnamon sticks, cloves and bay leaf. Add in rice and tumeric powder and stir continuously for 2-3 mins in low heat and keep aside. Heat 2 tbsp oil in the same pan and stir-fry the raisins until they turn plump or look like golden grapes and keep aside. Fry the cashew nuts in the same oil until they turn into golden colour. Drain both the nuts and raisin in a kitchen towel. With the remaining oil, saute all the veggies for 2-3 mins in low heat, add in salt, and stir-fry until they are well-coated with the oil and cooked slightly. Remove the veggies and add more oils to the pan to fry the thinly sliced onions until they turn into golden brown. then add a pinch of sugar to the onion while frying so that it will give a taste of nice caramelised onions. Remove the fried onions and drain them on kitchen tower. Keep a spoonful of fried nuts, raisins and half of the fried onions for garnishing later. As I used AMC cooking pot, I mixed everything together and add in water. Cook with medium high heat. When the timer showed 2 o’clock, use a fork to gently separate the rice so as not to get stickly to the bottom of the pot. Cover the lid again and continue to cook with medium heat until the timer hit 3 o’clock. Garnish with the rest of the nuts, raisins and & onion and serve.